What Increases Trust in Driverless Cars? Driverless cars face a mountain of technological, legal, and regulatory barriers, but it seems likely that some type of autonomous vehicle will eventually reach the cusp of widespread use. At that point, assuming the vehicle hasn’t been made obsolete by the invention of the hoverboard, it will have to earn the trust and confidence of the people who might use it. A new study (pdf) led by Northwestern’s Adam Waytz suggests one way to tackle this problem is by giving the vehicle more human features. The study, which Waytz conducted with UConn’s Joy Heafner and Chicago’s Nicholas Epley, required participants to drive different types of vehicles in a driving simulator. The researchers reasoned that the more human-like the car, the more people would view it as thoughtful and competent, and the more they would trust it to make decisions. At the start of the experiment the researchers assigned participants to three groups. In the normal condition participants simply drove the car themselves. In the agentic condition the car could control its own steering and speed, a feature that could be activated with the press of a button. In the anthropomorphic condition the car had the same autonomous functions as in the agentic condition, but it was also given a name (Iris!) and a female voice. The voice described the car’s autonomous features and when to use them, and it followed the same script that the experimenter used when explaining the car’s features in the agentic condition. Participants completed two six-minute drives around a pair of practice courses. After the first drive they reported how much they trusted the car and felt it was safe, how much they liked the car, and how much they perceived it to have human qualities. During the second drive the simulator presented a situation in which another car jutted out in front of the participant. An accident was nearly unavoidable, though it was clearly not the participant’s or their car’s fault. After completing the 2nd course participants reported how much they thought that they or their car were responsible for the accident. The results suggest that giving autonomous vehicles human qualities is an effective and easy way to make people more comfortable with them. Participants in the anthropomorphic condition reported overall trust ratings that were significantly higher than participants in the agentic condition, and those in the agentic condition reported trust ratings that were significantly higher than participants in the normal condition. Participants in the anthropomorphic and agentic conditions also liked their vehicles more than participants in the normal condition. More broadly, the study is a good reminder that when we imagine machines taking on new autonomous responsibilities we generally picture them in their non-autonomous form. If you had imagined an autonomous vacuum cleaner 25 years ago you might have been weirded out by the idea of a three foot tall, dust-bagged vacuum zooming around the room. Of course that’s not what we got. We got the cute, un-intrusive, and animal-like Roomba, and it doesn’t seem all that weird. That’s not a perfect analogy, but the point is that when we finally do have widespread adoption of autonomous vehicles the passenger experience may be different than it is today in ways that we can’t even imagine. So maybe Google should round up Spike Jonze and the four Pixar guys working on Cars 7, lock them in a room, and not let them come out until they create the most alluring humanoid car imaginable. Across the political spectrum there are growing pockets of support for congestion pricing. The benefits of creating more toll roads include raising much needed revenue, decreasing carbon emissions, and shortening commute times. In the long-run these outcomes will lead to better public transportation and create a positive feedback loop of higher revenues, lower emissions, and faster commutes. Yet for most Americans, even those who can easily afford tolls, spending money on roads that are currently free is like paying to use a bathroom. It’s for European socialists and characters in science fiction movies, not for us. One reason for our aversion to new tolls is that it’s psychologically difficult to make the money-for-time trade that’s at the heart of congestion pricing. Loss aversion — the tendency to prefer avoiding losses instead of acquiring gains — makes people opposed to giving up the freedom to drive for free. In addition, the availability bias, which leads people to overemphasize easily recalled information, makes it easier to envision the monetary cost of paying a toll than the opaque cost of losing time while sitting in traffic. The concept of time also has unique features that create problems when a person attempts to calculate the potential costs and benefits of a toll. For example, unlike money, time cannot be replaced or stored. Time is also not fungible — you can’t trade an hour for two oranges and then later trade two oranges for an hour. The results from Experiment 1 suggest that people prefer saving money over saving time, indicating their attaching more value to saving money, but this difference disappears after they are reminded of the importance of the value of time, which is showed in Experiment 2. Moreover, people discount the future value of saving time more greatly than that for saving money, as predicted, which confirms the conjecture that people’s tendency to underestimate the value of time may be even more pronounced in the future than in the present due to their overestimation of future time slack. The study is good candidate for replication because it has a number of important limitations, but the last result still reveals a lot about lukewarm reactions to congestion pricing. The researchers essentially found that the farther into the future a trip is going to take place, the more likely people are to prefer a price discount over an equivalent shortening of the journey. In other words, if a week before your journey you’re indifferent about buying a ticket that’s $10 cheaper or a ticket that will get you there an hour faster, six months before the journey you’ll be more likely to choose the cheaper ticker over the faster ticket. This is a problem because congestion pricing is a policy that people think about over the long haul. Even if a person believes that the time they save on a toll road is worth the money tomorrow, because time loses its future value faster than money, when they think about their commute next year they may believe it’s not worth the money. That means in order for someone to support congestion pricing they must value the time saved so much more than the money spent that they will still prefer having the extra time when they think about the tradeoff years into the future. One takeaway from the study is that the most effective way to garner support for congestion pricing is with a system of toll lanes rather than toll roads. Having part of the road remain free makes the option of choosing between time and money more salient (as opposed to full toll road, where choosing the money may not seem like a real choice because it means going a different route). When people imagine that they’ll always have this choice, they’ll think about congestion pricing on shorter time frame; there’s no need to worry about paying money next year because if you don’t want to you can just take the free lanes. Preventing these long term views of congestion pricing helps mitigate some of the effect of steep time discounting, and at the margin that should increase support for congestion pricing. The connection between poverty and academic achievement is the topic du jour for education researchers, but thus far there’s been a dearth of work examining how this connection might vary under different ecological circumstances. For example, do the academic consequences of an increase in family income differ between cities, suburbs, and rural areas? A new paper from researchers at the University of Pittsburgh and the RAND Corporation provides an initial answer. Using data from a sample of 6,600 nationally representative children born in 2001, they found that income increases for low-income families lead to more academic gains when the family lives in a large urban area. Comparisons of income–achievement associations among the lowest income families across urbanicity groups in the combined model (see Table 3) show that income had significantly smaller links to academic skills in rural, suburban, and small urban areas when compared with large urban areas. To give examples in terms of representative families falling along the income distribution, a $10,000 income increase for low-income families (i.e., those earning, for example, $20,000 per year) was related to a 0.05 standard deviation increase in achievement in rural settings and 0.07–0.09 standard deviation increases in achievement in suburbs and small urban areas. In contrast, for low-income children living in large city cores, a $10,000 increase in income was associated with 0.15–0.16 standard deviation increases in achievement. This relationship was significantly larger than the relationships in rural areas and suburbs (trend for math). The association between income and reading was also smaller in small urban areas compared with large inner cities at a trend level. All of this is fairly intuitive. When you live in a city it’s easier to use additional income to get access to a better school, hire a tutor, or buy better materials. Thus, in a city each dollar can “purchase” more achievement. In sampling children living across the urban–rural continuum, results suggest that economic disparities in achievement may be exacerbated in large urban areas. For families at the lower end of the income distribution, the relationship between income and early academic skills is at least 3 times stronger in large cities in comparison with rural areas. In other words, the strong relationship in cities between income and achievement means that economic inequality leads to relatively high levels of educational inequality. This is probably a case of cities providing the non-poor with opportunity to take advantage of their income rather than an unequal limiting of educational opportunities for the poor, but lately any kind of inequality is seen as a boogeyman. Inequality aside, the broader lesson is that it’s important for cities to increase the supply of affordable housing so that the poor can remain in cities even in the face of gentrification. (Matthew Yglesias pointed this out earlier today). Being able to stay in an urban environment allows the poor to take advantage of what cities can offer, and this includes an environment where increases in income lead to large gains in academic achievement. One day about six weeks ago I was waiting on the side of the Kenyan coastal highway. I knew where I was going and needed no help finding a matatu (the staple of East African public transport — think a VW bus with twice the passengers and half the safety features.) Two local Kenyans hanging out by the road approached, told me they would help me get a ride, and then made sure that the next Matatu, which was already in the process of stopping for me, did in fact stop for me. Despite the fact that they did absolutely nothing to aid the Matatu’s business, the conductor threw them a few coins. At first I was baffled that a business person in a third world country was giving away real money. Eventually I realized it was a good old fashioned case of successful rent-seeking/collecting. The men controlled that part of highway. If the conductor failed to pay them off they would tell me and everybody else to take any matatu but his. For the conductor is wasn’t worth it to not pay them. This type of “finder’s fee” transaction is fairly common around the world, but the Kenyan scenario was different because it wasn’t a taxi driver at a crowded airport who needed help fending off other drivers to get fresh tourists. It was a relatively barren stretch of rode on which the matatus were 10-15 apart. Immediate competition was nonexistent. The Kenyans paid by the conductor were literally providing no value. What I saw in Kenya got me thinking about whether that type powerless, wealth-free, nothing-to-lose rent-seeking could work in America. Find a street corner, hang out there all day, and if the cab drivers don’t pay you off tell all the cab-seekers that the drivers are unlicensed, unsafe, and cheats. It would have to be in an urban area small enough that the same cab drivers frequent your location, but large enough that there are enough people to make it worthwhile to pay you off. You’d also have to avoid problems with law enforcement officials or property owners, but would it be worthwhile for some of the unemployed or homeless to give it a shot? To connect this to a broader point, one of the challenges of a movement like Occupy Wall Street is to find leverage that can be used to extract concessions from those in power. On the Kenyan highway, my matatu friends were able to use their one resource — time — in order to capture rents and better their situation (although it’s not as if the matatu conductors are the 1%.) Time is also the resource that OWS protesters have in great quantity, but so far they haven’t found a way to turn it into real leverage. More on the economics of Kenya here and here. No, this photo isn’t part of a hot new reverse psychology trend in real estate marketing. 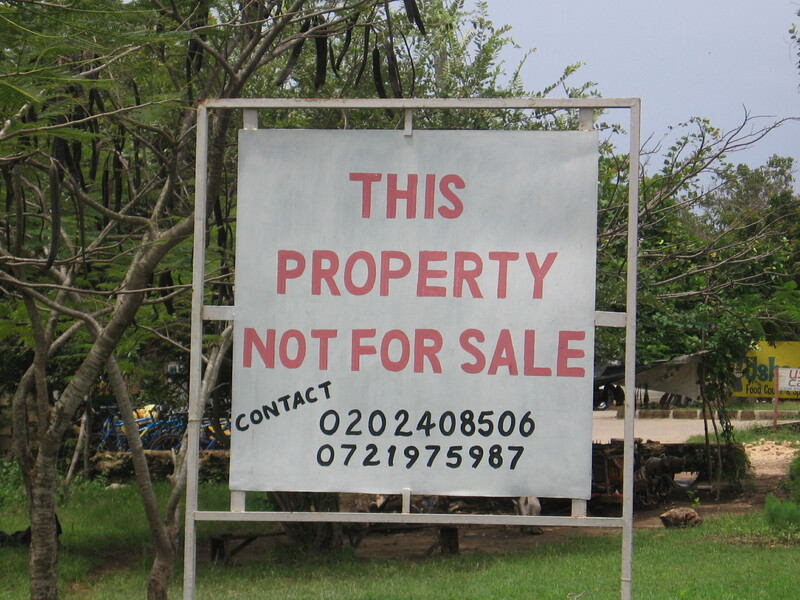 Signs like these are necessary for Kenyans to combat the popular and lucrative practice of selling land you don’t own. Does the Way We Give Directions Influence Urban Planning? Ever been asked how to get to place you’ve been to a million times and completely draw a blank? Good news. You’re not an idiot. According to a new study by a group of German psychologists, there are differences in the route a person creates for others to take, the route a person creates for themselves to take, and the route a person actually takes. Actual route navigation is predominantly direction-based and characterized by incremental perception-based optimization processes. In contrast, in-advance route descriptions draw on memory resources to a higher degree and accordingly rely more on salient graph-based structures, and they are affected by concerns of communicability. When people actually walk from point A to point B, they tend to take a lot more streets, make a lot more turns, and focus on direction rather than landmarks. Alternatively, when people give directions to others, they tend to pick a route that is much simpler and relies on landmarks or salient structures. It’s a stretch to apply these findings to urban planning, but I’m going to try anyway. On a very simple level, the study shows that we tend to place a greater emphasis on the aesthetics of buildings when we think about walking around than when we actually walk around. This may lead us to inefficiently emphasize form over function. The study also reveals a connection between buildings and knowing how to get places. When people envision getting around in places where there have been major changes to building height, style, or age, they are likely to feel a little more uncomfortable, a little more lost, and a little more biased against change. The study may also hint at a less salient bias against change. The mindset of preservation activists, zoning board members, and other planners most likely focuses on what it will be like for others to walk around. If creating directions for other people rather than for yourself leads to a more structure-dependent viewpoint, it’s possible that planning neighborhoods with others in mind also leads a more structure-dependent view. That view would over-emphasize the importance of existing structures and further bias planners against changes to building styles. A few weeks ago I mentioned a study showing that people are terrible at predicting how they will feel about using public transportation. Those results have now been confirmed in a new unrelated study. Affective forecasting in public transport was investigated in 2 studies. Study 1 revealed differences in satisfaction between users (n = 870) and non-users (n = 137). Users were more satisfied than were non-users with regard to reliability and safety, as well as with regard to overall satisfaction. It was also found that non-users mispredicted their satisfaction with public transport. Study 2 revealed that habitual car users (n = 106) reported greater satisfaction after using public transport for 1 month than they had predicted initially, which provided additional support for the hypothesis that habitual car users would mispredict their satisfaction with public transport. The authors attribute the poor affective forecasting to focalism (e.g. focusing on the salient drawback of waiting rather than the quicker commute or ability to read while traveling) and our inability to account for emotional adaptation. It’s worth noting that both studies were conducted in Europe, a place where I assume the gap between “perception of public transportation” and “enjoyment of public transportation” is much smaller than it is in car-loving, dilapidated-subway America. If the same kind of erroneous forecasting problem is happening here it means our transportation policy problem may really be more of a PR problem.